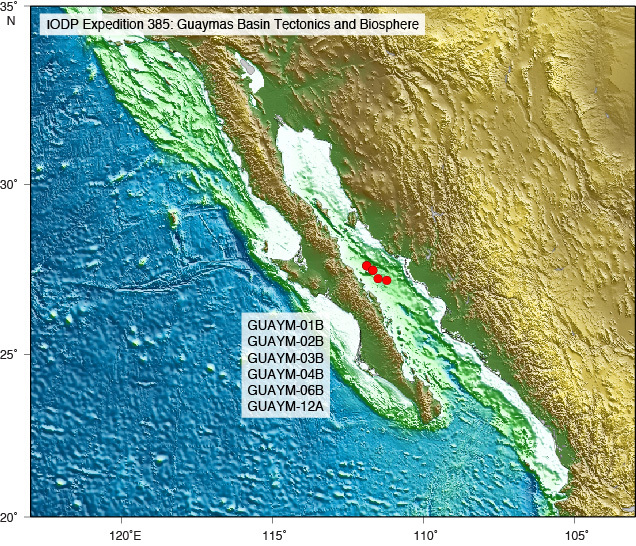 IODP Expedition 385 will core and log a series of sites in the Guaymas Basin to investigate the relationship of tectonics, magmatism, sedimentation, carbon cycling, and microbial activity. The Guaymas Basin in the Gulf of California is a young, marginal rift basin characterized by active seafloor spreading and rapid deposition of organic-rich sediments from highly productive overlying waters. The active formation of oceanic crust combined with a thick sedimentary overburden has given rise to a dynamic environment, where strongly connected physical, chemical, and biological processes govern the cycling of sedimentary carbon. Its fate upon deposition depends on the relative efficiencies of interrelating microbial and chemical processes, leading either to sequestration or release of carbon. Expedition 385 aims to illuminate the interaction between these processes and its ultimate consequences for carbon cycling, which will help understand similar settings in marginal seas throughout the world. (3) Advance our understanding of the conditions that limit life in the deep biosphere. Coring sill-sediment successions will provide an integrated record of igneous accretion as well as baseline data of carbon flux, including unaltered subsurface sediments and those that have experienced multiple generations of sill intrusion at depth. Petrophysical data (e.g., porosity/permeability) will also constrain crustal fluid flow and heat exchange that exert fundamental controls on this system. All findings will deepen our understanding of mechanisms of carbon remobilization implicated in global-scale rapid climate change.